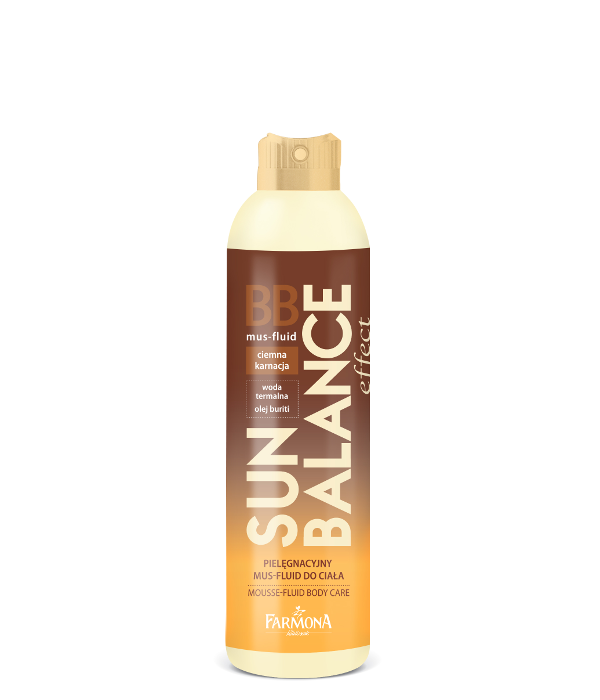 BB mousse-fluid body care recommended for light complexion, gives an immediate effect of sun kissed skin as well as takes care of it. The spray effectively masks imperfections and makes your body optically slimmer (gives a “spray-on tights” effect). Buriti oil, thermal water and hydromanilTM contained in the product, improve elasticity of the skin and intensively hydrate. Light formula makes application easier as well as gives beautiful and beauty appearance to the body. USAGE: Shake well before use. Spray the product onto your body or its parts from a distance of about 10 - 15 cm and spread it evenly on the skin. Wait until it fully absorbs. The result will keep to first wash. DANGER! Container under pressure. May explode if heated. Keep away from heat, sparks, open flames, hot surfaces. - No smoking. Do not spray on an open flame or other ignition source. Pressurized container. Do not pierce or burn, even after use. Protect from sunlight. Do not expose to temperature exceeding 50°C/122°F. Danger. Extremely flammable aerosol. Keep out of reach of children. Aqua (Water), Butane, Propane, C12-15 Alkyl Benzoate, Ethylhexyl Stearate, CI 77891, Glycerin, Dimethicone, Hydrolyzed Wheat Protein/PVP Crosspolymer, Hydrolyzed Caesalpinia Spinosa Gum, Caesalpinia Spinosa Gum, Glyceryl Stearate Citrate, CI 77492, Mauritia Flexuosa Fruit Oil, Tocopherol, Polyurethane-62, Trideceth-6, Xanthan Gum, Disodium EDTA, Sodium Hydroxide, Isobutane, Phenoxyethanol, Ethylhexylglycerin, 2-Bromo-2-Nitropropane-1,3-Diol, Parfum (Fragrance), CI 77491, CI 77499, CI 77019.